Just south of Pawley's Island in Georgetown County you will find a beachfront "town" known as DeBordieu Colony. DeBordieu is a mystery to most folks who vacation in Myrtle Beach, and many who live here. It is private, gated, and very securely protected from outside prying eyes. The beach there is also private. Some homes are in the multi-million dollar range and belong to celebrities. They pay for their privacy, and have it. Yet there are some homes in DeBordieu that are in the $200-300,000 range as well. Stretching from Highway 17 to the ocean for several blocks, there are homes that are on the marsh, on a lake, or oceanfront. Most homes are ten or twenty years old - not a lot of new construction. But they are so well-maintained and of such quality that age is often not a factor. Much like a country club, owners are paying club members. A wide variety of year-round club events and festivities such as holiday parades and parties, traditional oyster roasts and barbecues, sporting tournaments, and cultural clubs are some of the many social activities that maintain residents' sense of community in DeBordieu. Being a club member means having the use of the Beach Club, with two pools, a playground and fine dining restaurant with a panoramic ocean view. The Beach Club lounge offers the same cuisine informally, and several snack bars and grills make for every kind of dining. The Golf Clubhouse offers elegant views of the greens, a casual atmosphere with good food, and convenience after golfing or playing tennis. The DeBordieu Golf course was designed by Pete Dye and son, and offers a challenging course that winds through the marshes. 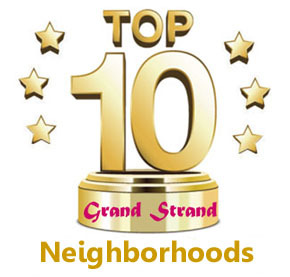 Its 17th hole was voted number one on the Grand Strand out of more than 100 golf courses. The Tennis Center has 8 Har-Tru and 2 hard courts, pro shop, and pros. Kids and adults can take lessons and participate in league tournaments. Several courts are lighted for nighttime play. There are more things to say about community than we have room to write, so if you would like more information about buying a home in Debordieu, give us a call and one of our specialists can answer your questions as well as showing you around this amazing vacation paradise.